NOTE: Screen shots and information presented in this article are based on a pre-release version of Pathways Into Darkness and are therefore are subject to change. Screenshots have been adapted to a system pallete and dithered and thus may not represent the actual look of the game. This article is not a review. 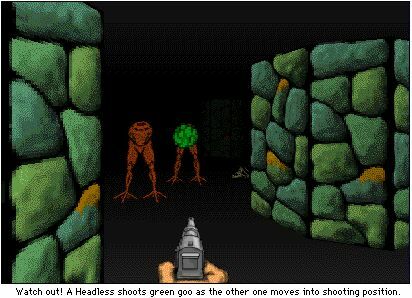 If you have ever played Wolfenstein 3D on a PC, then you'll have a good idea what Pathways Into Darkness is like. The game play in both games involves using weapons like guns, knives, and machine guns in a virtual 3D world to battle enemies and to proceed on to different levels. But the comparison between both games stops there. Not only do the high resolution graphics in Pathways Into Darkness make it stand out from its PC counterpart, but the continuous motion, textured mapped graphics set it apart from most games on the Macintosh as well. And that's not all. Pathways also features active panning stereo sound, auto-mapping, fully resizable windows, and an abundance of really nasty monsters that will have you trembling with excitement each time you round a blind corner. Published by Bungie Software, Pathways Into Darkness will be the third title released by this small Chicago-based software company. In development for over a year, Pathways is the mastermind of 22-year-old Jason Jones, an extremely talented programmer whose previous work at Bungie included Minotaur, a multi-player maze game released in 1992. But as IMG found, Pathways is very unlike Minotaur in that it uses a 3D world-view as opposed to Minotaur's top-down perspective. In fact, the 3D world in Pathways is so impressive it is unlike any game we have ever seen on the Macintosh. As creator Jason Jones puts it, "It's as close as you'll get to virtual reality without a helmet." Mission Overview. Roughly 64 million years ago, a semi-dead extraterrestrial being measuring two kilometers in length struck the Earth with an immense impact. Covered under thousands of feet of solid rock, the alien remained dormant for millions of years in the Yucatan Peninsula until finally it began to stir and dream. As it dreamed, weird things started to happen. The dreams were starting to turn into reality in the form of dark and gloomy caverns and landscapes, and yes, evil gothic monsters. But while past dreams had made changes only in its deep environment, recent dreams began to effect changes on the surface of the Earth as well, like the creation of a strange pyramid directly above the buried alien. This was a sign that the god was awakening. Something had to be done, or else the Earth could be destroyed. That's where you come in. As part of an eight man assault team, your job is to carry a small, low-yield nuclear device down to the alien's body and detonate it after you've evacuated the area. But it won't be as easy as it sounds. As fate would have it, the paradrop you were in was botched and you were separated from the assault team, who went into the pyramid ahead of you. Armed with only a knife and a flashlight (don't worry, you'll find a Walther P4 when the game starts), you'll have roughly four days before the alien awakens to set the nuclear device and get the hell out. Gameplay. 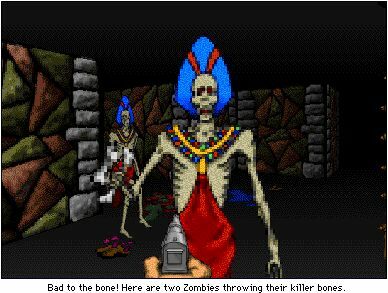 The arcade action in Pathways is shooting and killing the numerous monsters you'll encounter in the catacombs and corridors. As you move about, you'll find various dead German soldiers who have appropriately left behind guns and ammunition that are now at your disposal. And on occasion you will also find a few magazine clips littered about. How convenient! As you move on to higher and harder levels (about 40-45 total), you'll be rewarded with better pistols, machine guns, and even grenade launchers. The catacombs and corridors are laid out like a maze with lots of sharp turns. At any moment a monster could be waiting at a corner, so being on your toes is a must. The monsters usually shoot or throw something at you (like bones or gooey green stuff), which causes your health to deteriorate. But if your health gets too low, you can take a breather and rest for a few hours (not in real time). This replenishes your health. If a monster should attack while you are sleeping, you will be roused from your slumber. However, if your health bar should drop to zero, you will die and be forced to restore the game from where you previously saved it. So saving the game once in a while will be a good idea. You can avoid enemy fire by dodging left or right (I sometimes noticed myself leaning to my left or right in my chair trying to avoid enemy fire, that's how intense the action can get), but obviously the point is to kill the monsters with your weapons. Some monsters like the Headless require one or two shots for a kill, while other monsters like the Zombies require a few more. But don't think the monsters will line up one after another so you can shoot them at ease. The monsters will be smart enough to seek you and move in different directions as they come toward you, making them a little harder to shoot. All in all, Pathways will feature a total of about 20 different monsters and demons. In addition to the Walther P4s, MP-41 sub-machine guns, AK-47s, and grenade launchers, you'll also find crystals that have special powers. You can use these crystals against the monsters to freeze, burn, blow wind, turn to stone, create earthquakes, and lightning. The Interface. The interface in Pathways contains four main windows. The primary one, the World View window, provides the first person perspective. You direct yourself through the passageways and corridors by using the arrow keys on your keyboard. Other keys on your keyboard allow you to dodge left and right, use a selected weapon, pick something up and examine it, and use a selected crystal. As you move forward, objects in the distance that were dark gradually appear giving the game an incredible sense of realism. Since your visual range is only a few yards in the darkness of the passageways, your flashlight comes in handy. With the flashlight you'll be able to see much farther (and you'll be able to see what the heck is attacking you). The other windows in Pathways include the Inventory Window, which displays all the items you have picked up, the Message Window, which provides you with important messages, and the Player Window, which displays statistics like your health and your crystal's power level. Graphics. By far the most impressive aspect of Pathways are the 256-color, continuous-motion, texture-mapped graphics. Unlike most games today that use polygonal graphics (for example, Hellcats and VETTE! ), the graphics in Pathways are somewhat unique in that they have a "smooth" look to them. This is achieved by using a technique called texture mapping. Objects like walls, columns and monsters are first hand drawn, scanned, and colorized in Adobe Photoshop. Those images are then mapped to their respective surfaces in the program. The end result being an unusually rich visual environment. No matter what computer you have, Pathways will be configurable to run on slower machines in order to improve frame rate. Bungie wanted to make sure you didn't need a Quadra 800 to enjoy Pathways. By changing the resolution (either high or low) and resizing the World View window, you'll be able to choose a combination of parameters to find an acceptable frame rate. And if that's not enough, the program will even warn you if any open applications or background tasks are slowing down the game. Intangibles. Other features in the game show how much time and effort Bungie has put into Pathways Into Darkness. For example, the game will include three-channel stereo sound. The three-channel sound allows the game to play up to three sounds at a time. The stereo option will allow you to hear sounds that come from the right or left side. Another nice feature is the auto-mapping. As you move about, a map that is included in your inventory is magically drawn. Just click on the map to see what areas you've covered and which ones you haven't. The map comes in handy when you get lost or need to retrace your steps. Pathways is not just a shoot-'em-up game. The game also involves solving puzzles that allow you to go onward to the next levels. Some of the puzzles are pretty tough, so a few of the dead people you come across will actually talk to you and give you hints. But finding out how to talk to the dead people is a puzzle in itself. The arcade action combined with the brain-teasing puzzles in Pathways should appeal to gaming enthusiasts of all kinds. Requiring a color Macintosh, system 6.0.7 or higher, a hard drive, and 2 MB RAM, Pathways Into Darkness will ship (hopefully) in late July. For further information, call Bungie Software at (312) 493-2849; Fax (312) 493-4557; America Online: BungieSoft; CompuServe: 70272,2157; AppleLink: Bungie. Back to the Pathways Into Darkness page.